I am fond of telling people that I got my start in playwriting by wandering into it after working in the space program for many years. This is true, as far as it goes, but I would be remiss if I didn’t point out that I was certainly a happy theatre addict for many years before that. I was reminded of this recently when I was participating in a workshop given by Playwrights’ Workshop Montreal. I had a free evening and decided to go to Place des Arts for a performance of “Porgy and Bess,” which I’d never seen. (It was magnificent.) I grew up in Montreal but haven’t lived there in decades, and this was my first time there since high school days. 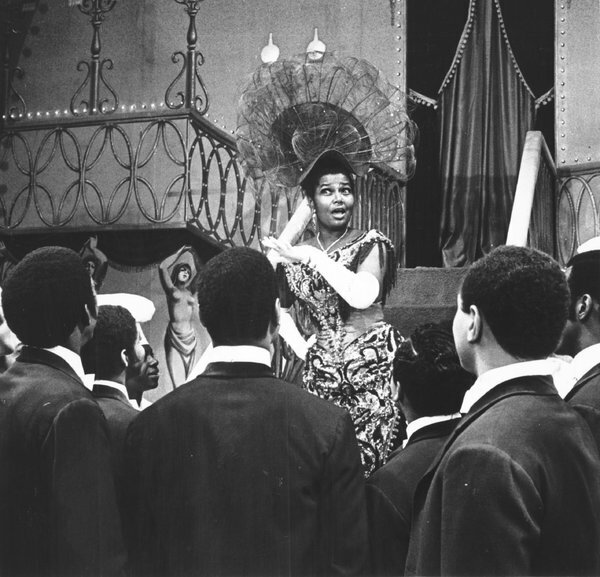 And while my memory may be overlooking some other performance, one of the first shows I recall seeing was “Hello, Dolly!” in that same space, with the incomparable Pearl Bailey in the lead. It was magical, and part of the magic was undoubtedly her rapport with her audience, with whom she happily chatted whenever it took her fancy – discussing plot elements, recalling her earlier visits to Montreal, and enthusiastically diving into a second round of the show’s signature number, her entrance and welcome at the Harmonia Gardens restaurant. Likewise, I was in New York last week to work on a new show (more on this in due course), and as I had a free evening I took up a friend’s recommendation and went to see the new Terrence McNally play, “Mothers and Sons,” with Tyne Daly. I was delighted to discover that it was playing in the same theatre where I saw my very first Broadway play – The Gin Game – only two years after my introduction to Pearl Bailey. It was a simple story, a two-hander with husband and wife Hume Cronyn and Jessica Tandy, and it was a delight to watch. There was simply no question: I was hooked by the magic of the theatre. I never conceived back in the 1970s that I might one day have the opportunity to explore that magic firsthand – and even, in some cases, help to create it. Today, as I scramble with whatever writing project happens to occupy me at the moment – whether I wrestle with a problem of plot or character or simply sail through pages of dialogue – I get a little lift and smile a little more broadly to think back at that much younger self sitting on the edge of his seat in the darkened theatre. And I wonder what piece of theatre might bring joy to some other young person out there today, and what that person will be inspired to create tomorrow.